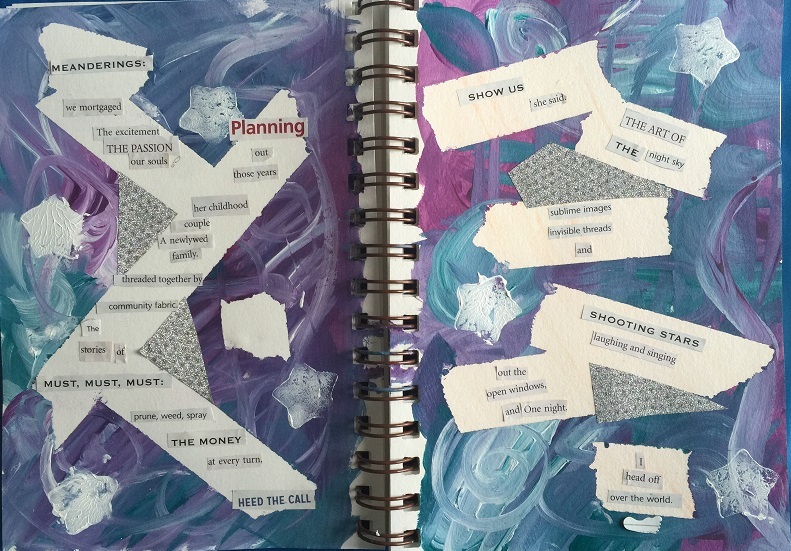 I didn’t actually begin this art journal page with a poem in mind. It was one of those lovely serendipitous things that seems to form on its own. I’m reading Elizabeth Gilbert’s book Big Magic:Creative Living Beyond Fear in which she talks about ideas looking for someone to give them physical form. That’s how this creative process felt. 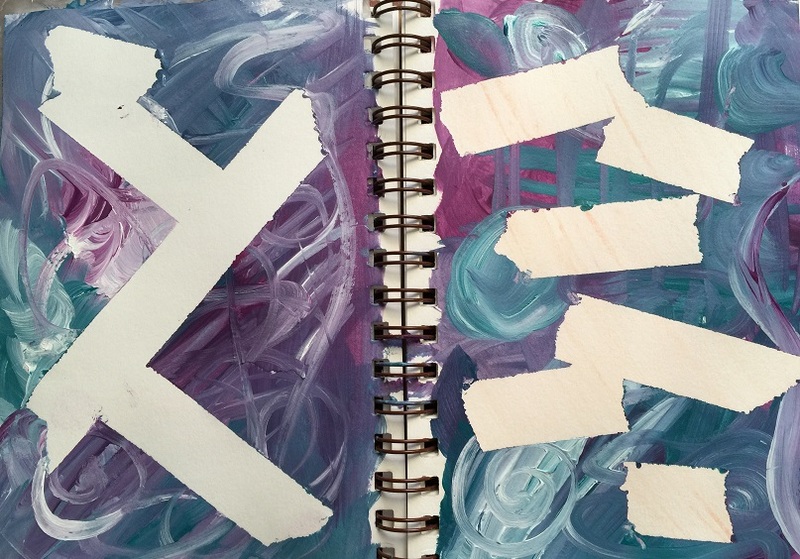 My original intent was to play with an idea I’d come across – to use tape as a mask to maintain some white areas to journal on. 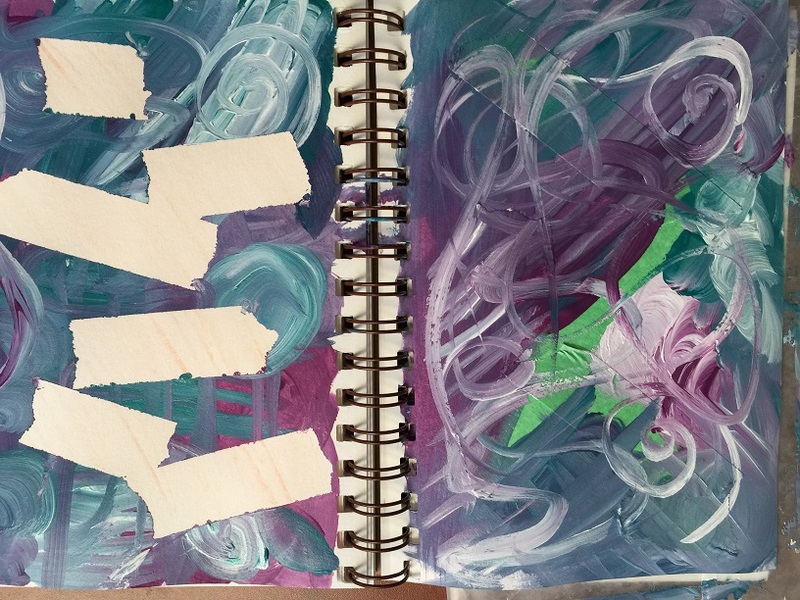 After I gessoed the two pages, I taped off random areas, trying for a flow without forcing a neat pattern. I even ripped the tape off the roll because I wanted rough, organic edges. You can see the tape on the right in the picture below. If you want neater edges, cut your tape and stick it down tight along the edges so the paint doesn’t seep under. Also, remove your tape while the paint is still damp. The drier it becomes, the more apt you are to peel away the paint with it. In this next picture I’ve removed all the tape. If you look closely you may see some orange streaks on the white. 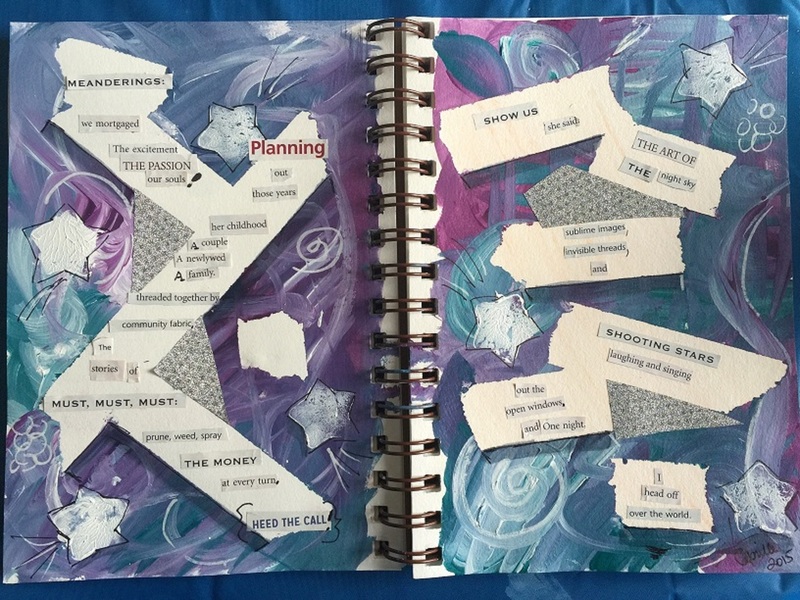 I had other plans for these pages but it didn’t inspire me so I recycled. Another moment of serendipity — those subtle lines end up supporting the final theme although I didn’t know it at this point. I also had some erasers in the shape of stars and I wondered how they would work as stamps. So I popped a few on. I learned that I needed to be neat with the paint or I just got a star-shaped blog but other than that I’ll keep them in my supply stash. I also added some sparkly bits of duct tape I had left from another project. A definite theme seemed to be emerging here. This is where it got fun. 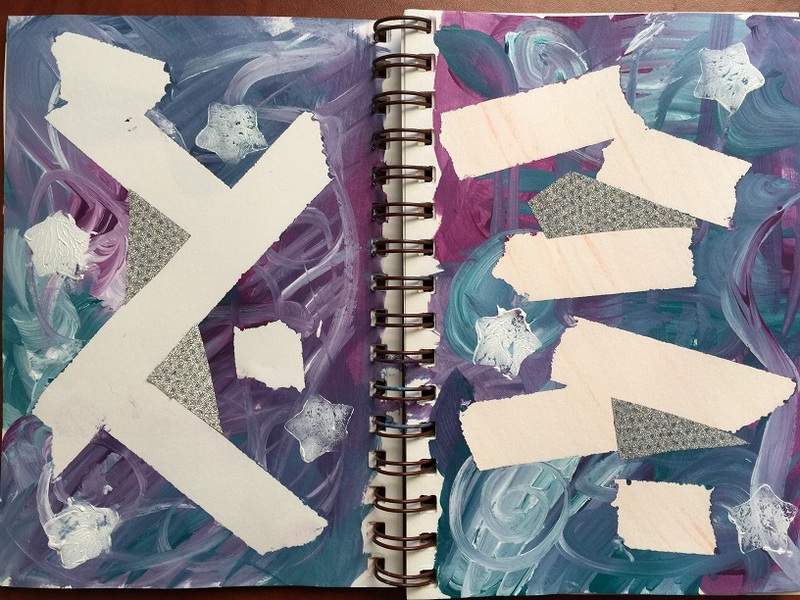 Thinking about the spaces I’d created for journaling I tried to come up with something I wanted to say on these pages but nothing quite worked for me. That’s when I got out a box of words and phrases I’d cut out of magazines quite awhile ago. I dumped them on my work desk and started playing, kind of like those magnetic collections of words people used to put on their fridge. I also set myself a creative constraint. I had to use the words I already had in that container. I felt by adding new ones it might become too ‘precious’, too contrived. Then, like magic, it came together and spoke to me. I grabbed my glue stick right then to made my ‘ransom note’ poem permanent, before the Inner Editor starting second guessing me. The final touches were done with a white paint pen and a black sharpie. Click on the image below if you’d like to see it full size.